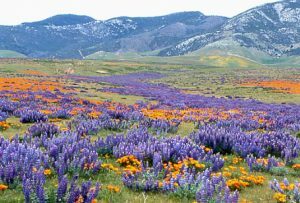 The acclaimed Theodore Payne Wild Flower Hotline, founded in 1983, offers free weekly online and recorded updates – posted each Friday from March through May – on the best locations for viewing spring wild flowers in Southern and Central California. TPF has been producing the hotline for 36 years because we love wild flowers and want to help people to enjoy these gorgeous plants. All of the locations mentioned are on easily accessible public lands. We include a range of sites from urban to wild, from distant to right here in Los Angeles. The hotline itself is manifestly old school: you call a number and listen to three to five minutes of a person talking (the wonderful voice of Joe Spano!). We also post a longer, more detailed report online in PDF format, which is still a pretty old school form of technology. Last week, I did produce a hotline podcast because, after all, we do live in the modern world. But the ease of technologically-assisted communication and image sharing has driven up the hotline audience dramatically. Our modest Facebook post announcing the 2019 season reached more than 100,000 people. As of today, more than 46,000 have visited the hotline page. At the same time, media outlets from The Daily News to Smithsonian have promoted it, sometimes with unintended consequences. All this publicity and much more has driven record visitation to flower sites, resulting in trampled plants, careless selfies, unsustainable crowds, closed roads, etc. How do we respond to this “golden poppy rush”? What do we say when so many people are visiting flower fields without observing proper etiquette? We could be up in arms, but this is not a moment for righteous indignation. This is a golden opportunity to use people’s interest in beauty to educate them about their natural environment. 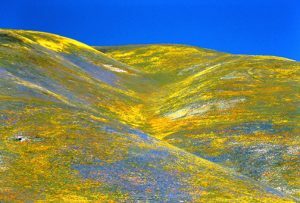 Thousands of people want to see California’s wild flowers and we want them to love and appreciate those flowers. We want to encourage their interest. It’s our mission to move people along the spectrum from unmindful consumption to thoughtful stewardship. 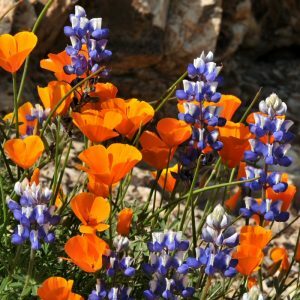 The Wild Flower Hotline is meant to help people enjoy the unique and beautiful nature of California, without diminishing that resource in years to come. Every exquisite wild flower holds the promise of bringing more flowers. We encourage people to treat these floral treasures with the respect due to all living organisms. You could always Grow a Super Bloom at Home! It would be helpful to have the hotline number easily found on the website. Thank you! I’m sorry you had a hard time finding the number. We do try to make it easy to use. The hotline number — (818) 768-1802 ext 7 — is posted on our home page under NEWS and on the hotline page. If you call the Theodore Payne Foundation main number, it is the first option you are offered before being put in touch with a person. I hope you’ll call again! Tried to call you but the number is not in service. I would like to get info. on where to see the super bloom today when crowds should be lighter. Almost any site will have reduced crowds on a week day. The further the site is from large populations, the fewer the people as well. Theodore Payne Foundation is closed on Sundays and Mondays so there is no one to answer the phones. You can call Tuesday to Saturday for more advice. We did have work done on a closed day that put the phones out of order for two hours. Sorry we missed you. I’m planning to go there on monday 04/08. do I still get to see the bloom or not? There are plenty of flowers still blooming all over the region. Check the Wild Flower Hotline for destinations. The bloom will progress north over time. no one area will remain in bloom for many weeks. I suggest you follow the hotline each week to get ideas of where to see flowers. What is the link to the website to see the pdf for the written version? The link is on the hotline page on this web site.